Villa Tita is a mix of contemporary design & traditional Mexican details decorated by Peter Bowman (voted one of the top 100 designers in the world by Architectural Digest) with unforgettable views of Los Muertos Beach and across the Bay of Banderas. The property is a tranquil oasis, yet just steps from popular Los Muertos Beach and the Romantic zone or continue walking to the Malecon and historic downtown. 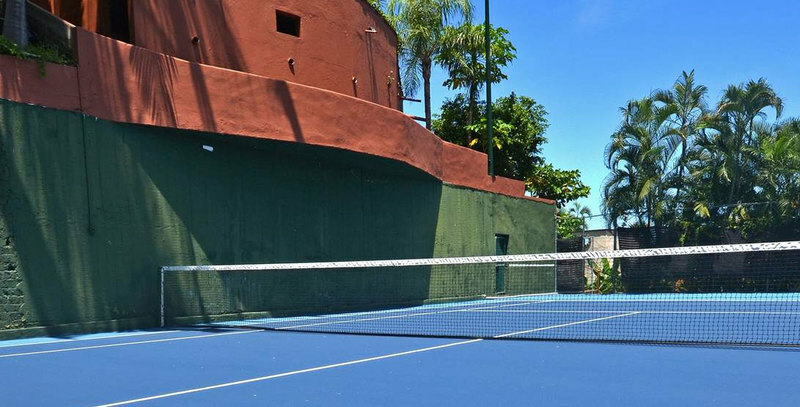 This property has a Tennis court and one of the most spacious sun filled pool terraces in the area. The main house has 2 levels with 5 Bedrooms and a private casita with a 6th bedroom, the pool terrace with covered Cabana with wet bar and tennis courts on the side. Enter through an iron gate, down the steps into a private courtyard, thru antique doors to breathtaking views of the town and bay. - 6 Bedrooms w/private bath, ac, fans & Ocean views. - Approximately 30,000 sq. ft. of land with 19,800 sq. ft. of living space. - Heated pool (8 X 30 FT ) with Pool Cabana with wet bar. - Tennis courts, lighted and built to USTA standards. - AC in all bedrooms & main Living & Dining. - WIFI / - Free long distance and local Telephone. - TVS: Flat screen TV’s in all bedrooms and a 70 inch TV with Blueray DVD player in main Media zone. - STAFF 3, cook, houseman & housekeeper daily except Sundays & holidays. - Bedroom #6 The Casita: intimate private apt. Bedroom with King size bed, kitchenette and Bath, AC, ceiling fan, TV, IPOD Dock /alarm clock & Safe. Private terrace with ocean Views. Main Level: outdoor living & dining areas, Foyer, Kitchen, Living area, Media area, dining & 2 Bedrooms. - Private courtyard with outdoor living area & BBQ. - Covered outdoor dining with views of the town and bay. - Living, dining & Media all with views of town and Bay. - Bedroom #1 Master; King size bed, private bath with shower, AC, fan and safe, private sitting area views of town and bay. Opens to common Terrace. - Bedroom #2: King Size Bed, private bath w/Shower, AC fan & safe , views of bay and town, Opens onto common Terrace garden view opens to main common terrace. - Bedroom #3 King size bed, private ensuite bath w/shower, A/C, fans , ocean view opens on to shared Terrace, Safe TV & Ipod Dock. - Bedroom #4 King size bed, private ensuite bath w/shower, A/C, fans , ocean view opens on to shared Terrace, Safe TV & Ipod Dock. - Bedroom #5 King size bed, private ensuite bath w/shower, A/C, fans , ocean view opens on to shared Terrace, Safe TV & Ipod Dock. Tennis courts down another level. Beach access by private stairs to Santa Barbara Street approx 2 blocks to Los Muertos Beach. Staff of 3 persons daily except Sundays & National Holidays. 1. COOK: 2 meals per day, shopping, preparation, serving & clean up. 2. HOUSEMAN: serves meals, bartender & serves drinks, helps with luggage, cleans pool & basic maintenance details. 3. HOUSEKEEPER: general housekeeping and household linens: cleans bedrooms each day, changes beds 2 per week. Pay for 6 stay 7 nights on any reservation made with full deposit paid before end of 2014. Christmas and New Years not included.